One thing that I've wanted to introduce into my blog is more crochet related content. If you follow me on Instagram, you'll already know that I'm a keen crocheter. But I don't really feel like my blog reflects that. 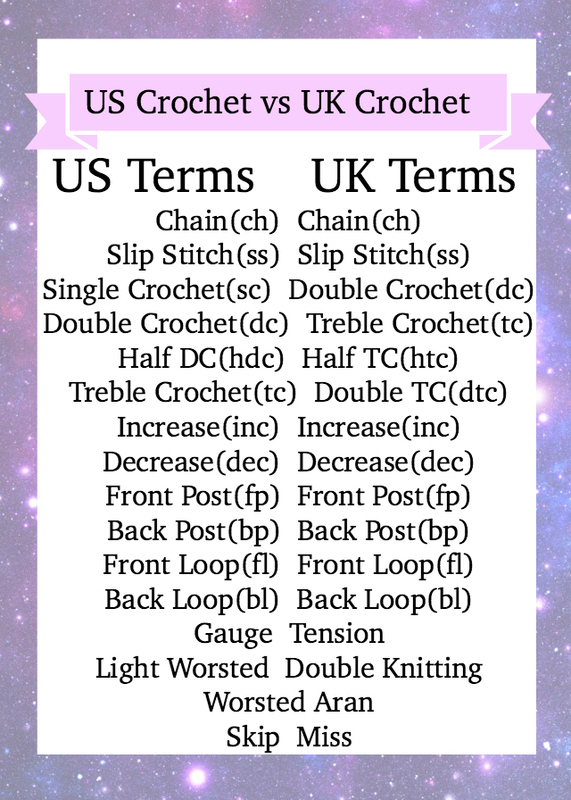 One of the first things that I'm bringing in is this cheat sheet/printable to help you differentiate between US and UK crochet terms. If you're learning to crochet then you'll probably have noticed that they're different - which can be really confusing to a beginner! When starting a new pattern the easiest way to save yourself any confusion it to check to see if it specifies. Most patterns will state this either at the beginning or right at the end of the pattern. If you're using a physical crochet book, check where it was published. Over time, it becomes easier to spot the difference. Now I can generally tell just by looking at a crocheted item whether it's UK or US based. Despite being Scottish, I actually find the US crochet terms more simple. They make more sense in my head (where is the single crochet in UK crochet?) and because I taught myself online, most of the resources I was using were US based. So I hope that helps! If you liked this post I'd really appreciate it if you could pin it on Pinterest. If you aren't already following me on Pinterest you can follow me here. Leave your Pinterest account linked in the comments and I'll check out yours as well!